The first thing we decided on when we got to New Paltz was to sign up for all the activities we possibly could. We wanted to get the most out of the area and we knew that time would fly, so when the schedule for the activities was published we basically booked everything on there. This weekend we had both tubing and zip-lining planned and I was literally rushing through the week so that I could jump on the bus and go. I’ve been tubing once before in the Philippines but it was a very calm and relaxed ride – nothing like what we experienced now! 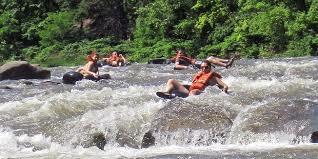 The tubing in Phoenicia is nothing for the easily frightened. If you’re afraid of water or of losing control – don’t go! But, if you love adventures and if you don’t mind getting totally soaked and a bit bruised, sign up! I laughed all my way down the stream, except for one single moment when I flipped and flew of my tube, at that point Stephanie was the one who did all of the laughing. I am so glad that we went, it was so much fun and the nature surrounding the river was astonishing. I even enjoyed the bus ride there. It’s so exciting to see the areas surrounding New Paltz, and since we don’t have access to a car the bus rides to the different activities are actually a really good way to get a grip of the area! Oooh, I’m so sad i missed it! It sounds so much fun. But I am really glad that we listened to Jeff’s advise to book all of the activities. Now we have the kayak trip on Saturday and hiking next week. And of course we can’t forget the trip to Boston! I am so excited!